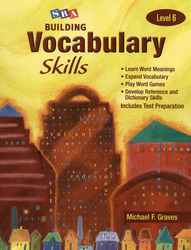 In the Student Edition, students learn key vocabulary skills through themed, four-part lessons that include practice in word meanings, reference skills, word building, and word play. Weekly word lists include content-area words. Includes a complete Glossary and a Tools and Reference section.